In this official photo, Cambodian Prime Minister Hun Sen speaks during a meeting at the National Assembly building in Phnom Penh, April 4, 2016. Cambodian Prime Minister Hun Sen on Friday said the country’s commune elections that will decide a host of local offices across the nation will be conducted as scheduled. “The election in Cambodia will proceed regularly, and nothing will change the date,” he said in a speech Friday to the Ministry of the Interior. It was unclear exactly what Hun Sen was referring to as there have been no notable calls to delay the commune elections. National elections are scheduled for 2018. While there may be no significant calls to delay the elections, Hun Sen and his Cambodian People’s Party-led government have been roundly criticized for corruption, intimidation and attempting to smother dissent by throwing opponents in jail. 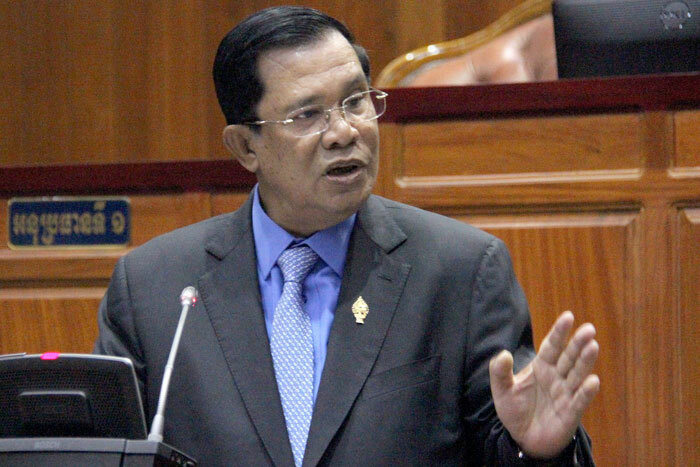 “I think people just want to defame the government,” Hun Sen said. The latest criticism of Hun Sen and the Cambodian People’s Party (CPP) was sparked by an administration-backed move to exert more control over political parties. Among the amendments to Cambodia’s law on political parties that Hun Sen and the CPP are seeking is one that would bar anyone convicted in Cambodian courts from holding a political party’s top office. The “culprit law” would also dissolve any party whose president is convicted of a crime and would enable the government to seize the party’s property. Cambodian courts are notorious for their lack of independence. Opposition politicians often find themselves before Hun Sen’s pliant courts on various charges. The new party law has already won approval in the CPP-dominated National Assembly. If the changes are approved by the Cambodian Senate and signed by Cambodia's King Norodom Sihamoni, as expected next week, the amendments would also give the Cambodian Supreme Court the power to dissolve a party caught committing a list of vague offenses. The Interior Ministry would also be empowered to indefinitely suspend a party for similarly vague reasons. In response to the pressure and to prepare for the June 4 local elections, the Cambodia National Rescue Party (CNRP) is preparing for a party congress on March 2 at party headquarters in Phnom Penh, a CNRP spokesman told RFA’s Khmer Service. According to a CNRP statement released Friday, the congress will serve as a rallying point for party candidates for commune offices, election of a new party president and vice president, and the adoption of the political message for the commune election campaign. The CNRP will have to choose new leaders as its long-time president Sam Rainsy resigned after it became clear that Hun Sen and the CPP would push the new party laws through the legislature. Under the proposed party law changes Sam Rainsy would be prohibited from serving as a top party officer because he has been convicted of a crime. Sam Rainsy was followed by three other opposition party members who resigned from their positions late Thursday, saying they feared the CNRP would be dissolved if they remained, local media reported. Meach Sovannara, Um Sam An, and Hong Sok Hour all stepped down from their party leadership roles, according to letters posted on Facebook and confirmed by a source close to the situation, The Phnom Penh Post reported. The three men have all been convicted in high-profile cases that are widely considered to have been politically motivated. Reported by Moniroth Morm and Vuthy Tha for RFA’s Khmer Service. Translated by Sarada Taing. Written in English by Brooks Boliek.